(News.com.au, AUGUST 25, 2015) If there’s one thing you wouldn’t expect Gen-Y to do, it’s rise up in support of a “sacred war” and pledge their “faith and will to annihilate the enemies”. One million North Korean millenials have vowed to defend their country as tensions with the South boil over, at least according to the state-run Korean Central News Agency. We’re used to antagonistic rhetoric and displays of strength from the Democratic People’s Republic of Korea, but the strangest aspect of the latest confrontation is the visible enthusiasm of the country’s teens. This positivity abounded in the capital, Pyongyang, yesterday, with truckloads of young soldiers singing martial songs driving around the city and large crowds materialising for impromptu rehearsals of activities planned for the ruling Workers Party’s 70th anniversary in October. By evening, people had gathered around televisions in public places — not to learn the outcome of crisis talks with the South, but to watch the debut of Boy General, a popular cartoon revamped for the first time in five years at the order of Kim Jong-un. It may seem like unusual teenage behaviour, but experts say it’s no surprise. It’s what they’ve been trained for since birth. Citizens in North Korea live in a bubble sealed off from the rest of the world, where they have no choice but to adhere to the status quo. They are expected to show the unerring devotion to their leader that was demonstrated when Kim Jong-il’s subjects took to the streets wailing and tearing their hair after his death, in scenes that baffled the world. Young people growing up under the totalitarian regime have little freedom of movement, means of communication or economic independence. Foreign film and literature are banned and they are taught a revised version of history in school, learning songs of worship that praise the ruling Kim family. Kim Jong-un has made a great show of being a progressive young leader, introducing new freedoms including letting people eat fast food, allowing them to own mobile phones and permitting women to wear pants and jewellery and ride bicycles. But the regime continues to exercise control over these changes. “Life in North Korea is pretty artificial,” said Dr Petrov. “There’s access to fashionable clothes in Pyongyang, where people can see, but in rural areas, even if you have a mobile phone there’s no electricity, or access to the web. People eat a little better now but life is pretty difficult.” For most young people, there’s little time to think about politics before they begin their mandatory service in the Korean People’s Army at 17. It can last as long as a decade for men, while women serve for around seven years. With young people not leaving the military until their mid-20s, many commentators see the slightly older generation of “in-betweeners” as the state’s best hope for rebellion. Middle-aged people, known as jangmadang, have little interest in a revolution after surviving the Great Famine of the 1990s, focusing on becoming pioneers in a more capitalist market, explains Professor Kim Sung-kyung, from the University of North Korean Studies in Seoul, South Korea. The youngest members of society are increasingly influenced by trends from the outside world, she told the NK News, such as fashionable clothes and eating pizza — but these advances are “superficial” and carefully managed by the government. Prof Sung-kyung says the real subversion comes from those in their late 20s taking the opportunity to “punch holes in the regime in their everyday lives” through “secretive experiences they can share each other, without being caught by the government”. As young people start to share ideas, smuggling videos and USBs in from South Korea, there is an opportunity for freedom: which is exactly what the state is so working hard to suppress. It’s when citizens dissent that the harshest side of Kim Jong-un’s dictatorship is revealed. Park Ji-hyun left North Korea with Chinese traffickers during the famine, forced to leave her dying father behind. After six years, she was reported to the authorities and sent back. Classified as a defector, she was sent to a labour camp and worked to the bone, clearing mountainsides with her bare hands. “You could say the whole of North Korea is one big prison,” she told Amnesty International. Eventually she was discharged with tetanus in her leg and, homeless and sick, managed to make a second escape. Her story shows how hard it really is. It’s estimated that hundreds of thousands of North Koreans, including young children, are enslaved in prison camps, and arbitrary arrests and public executions are commonplace, according to Human Rights Watch. The organisation says it’s this, along with the lack of political opposition, independent labour unions, free media or civil society that constitute the real challenge to youth empowerment. When we hear stories about defectors or progressive material slipping into this repressive society, it’s tempting to think it’s only a matter of time until the regime is overthrown. The young people who swore allegiance this weekend somewhat dispel that notion. Propaganda is key. Defector Jang Jin-sung, formerly one of Kim Jong-il’s poets, said he fully believed the rhetoric he helped to spread. That was, until he obtained special permission to visit to his hometown and saw corpses piled on the pavement, realising for the first time that the famine rumours were true. The current atmosphere illustrates that. The stand-off began with explosion of landmines south of the heavily fortified border, which Seoul said had been planted by the North. 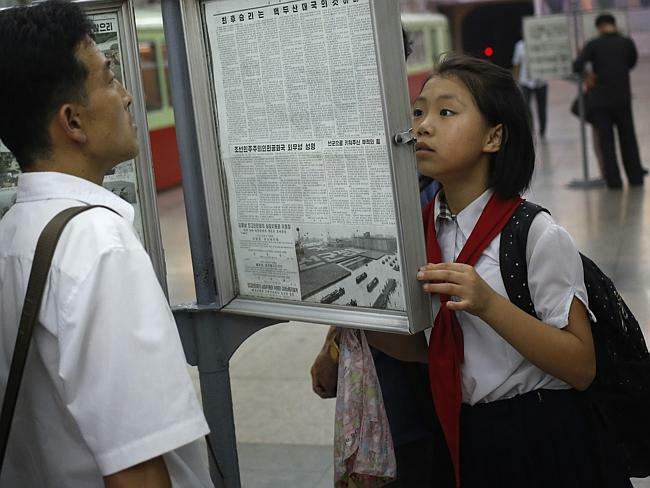 The South responded by blasting a barrage of world news, pop music and criticism of Kim Jong-un’s oppressive government from loudspeakers along the border. The North denied involvement in the mines and demanded it cease this “psychological warfare” or face attack. By Saturday, the DPRK had mobilised more than 70 submarines and undersea vehicles, according to Seoul’s Defence Ministry, and artillery fire has been exchanged. It’s unclear what will come of the talks. Analysts in Seoul say the North fears the broadcasts could demoralise its frontline troops and inspire them to defect. This forceful response shows it knows only too well the power of propaganda, and is determined not to let its young people hear it.